Doesn't discriminate against left-handed gamers. Other features include in-mould rubberized side grips with a honeycomb pattern to prevent slippage, four programmable buttons rated at up to 20 million clicks, and three-color backlighting with three lighting effects—static, breathing, and three-color breathing. "The Abyssus V2 is a price-performer in the Razer mouse line, offering gamers high-level functionality and durability at an entry-level cost. 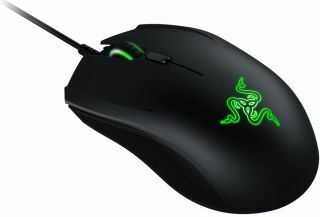 The mouse is perfect for lefties or right-handed players, casual gamers, or users looking for an inexpensive second device," Razer says. If interested, you can pre-order the Abyssus V2 for $50 direct from Razer or Amazon. Shipments will go out sometime later this month.